Over the years our Diocesan magazine Fides has published a large body of writing about the Catholic Church in both Finnish and Swedish. The text range from items of long-gone news, which may be of historical interest, to articles with a content that remains useful regardless of the year of writing. Nearly all issues of Fides the new Millennium, those published from late 2001 onwards, are available in the digital Fides archive, which is open to the general public. However, the lack of a search function for the Fides corpus has limited the use of the pdf files in the archive. To remedy this, it was necessary to put together an index of articles published in Fides. The index makes it possible to search for articles of interest either by using a keyword search or by glancing through the headlines. The current index is made available on this page and covers the bigger articles of the archived digital copies up to and including the issue Fides 5/2013. Outside the scope of this index are most news items, letters to the editor, smaller articles and regular columns. For each item the index lists (if possible) issue number, page number, author, headline and between one and three keywords. The first keyword describes the type of the item, and the keywords used are news, sermon, speech, letter, interview, bio, event, travel and article. The second keyword explains the content when the title is unclear (e.g. interview where the interviewee is not named in the headline). The third keyword links an item to our whole diocese or any groups within (parishes, religious orders, etc.). These keywords are used only when the item is connected to the activities in Finland, e.g. biographies of saints belonging to religious orders are not marked. Of the downloadable files available, pdf format is suitable for simple searches. Spreadsheet files are recommended if the index is used more regularly: these formats allow own data edits, adding own keywords and the creation of more specific indices. A pdf version of the index for Fides magazine opens when you click here. To go to the Fides archive, click here. 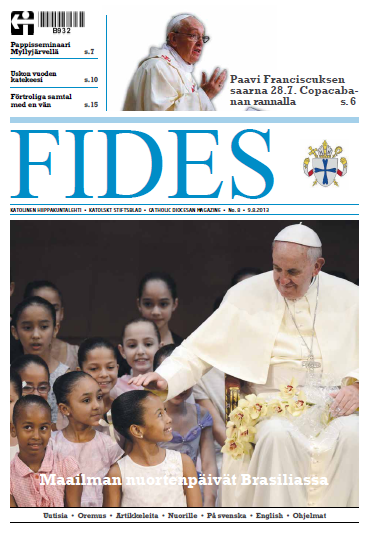 The latest issues of Fides are not included in the index, but you can also find them here.